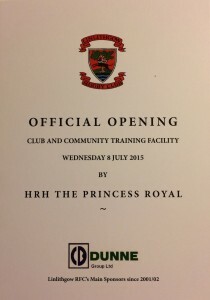 Today the Club was honoured with a visit from Her Royal Highness, The Princess Royal, to officially open the new Club & Community Training Centre. 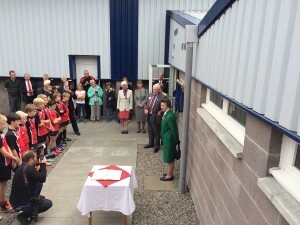 Princess Anne, patron of Scottish Rugby, spent over an hour at the Club meeting members and guests and viewing the new facilities in action. The Princess Royal met with members of the project team, funders and fundraisers and those involved in the construction of the new facility, before touring the new centre to see it in action. The “action” was provided by a group of Wee Reds on the 3G pitch, with school and recent former pupils on the pitch outside and current Reds’ players and coaches in the gym. Before leaving, the Princess Royal unveiled a plaque to commemorate the day and congratulated the Club and its members for their tremendous achievement. Ian Rankin, President of Scottish Rugby, added his congratulations when he addressed the members and guests in the Clubhouse after the Princess Royal had left. A famous day in the proud history of Linlithgow Rugby Football Club!